With Adobe InDesign you can now publish your document online so that it can be viewed in any web browser, it works on desktop and also on any Phone or tablet. 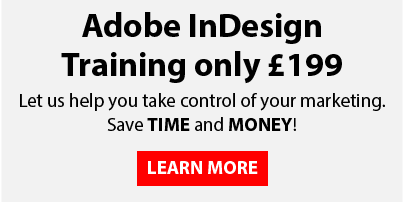 Publishing online can be used for finished documents but is also a great way of proofing any design work that you are creating with Adobe InDesign. When you publish your online document there is a URL and that never changes so you can just keep updating the artwork and your client/boss can just refresh the link whenever they want to see the latest version of the design as it progresses. To make your InDesign Published document more interactive you can also add a huge variety of animated elements, image fades and hyperlinks etc that are not available when you simply export as a PDF. Once the document is published online you are able to download a PDF directly from the page and also generate code so you can embed the document in any website. 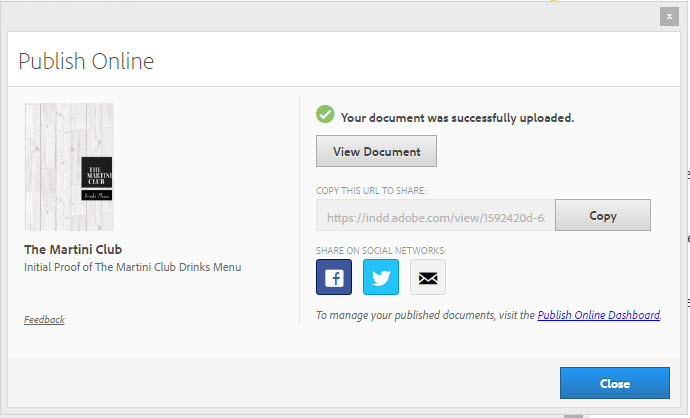 The published InDesign document can also be shared easily on social media or via email. 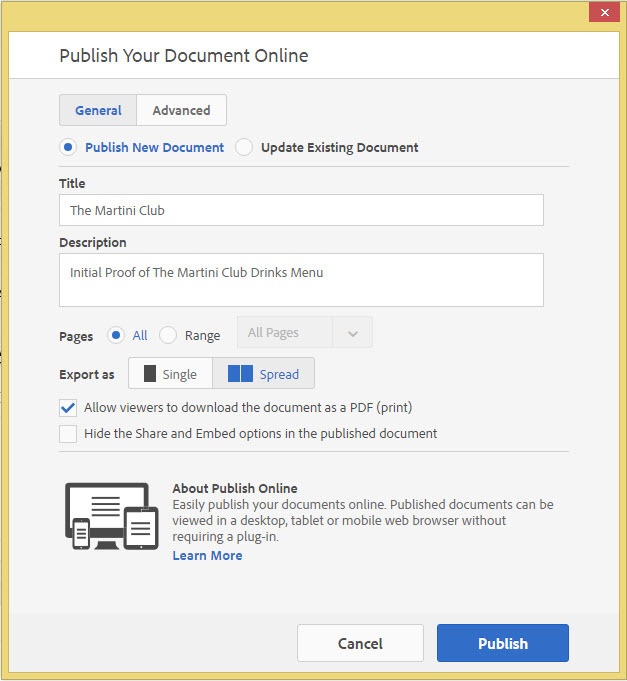 How do you publish your InDesign document online? You may have noticed the ‘Publish Online’ button appear at the top right hand side of your InDesign workspace, it doesn’t matter what document you have created, it can have been intended for print or web all InDesign documents can be published online. The fist menu that you see when you have clicked the ‘Publish Online’ button is the general settings, here you can state the title of the document, by default this is the name of the file but you can change it to whatever you like. If you have already generated an online document previously from your InDesign document you can click ‘update existing document’ this will keep the same URL as the previous time so anybody who already has the link can just refresh it to see the amended InDesign artwork. It is very similar to generating a lo resolution PDF with a few more option on how to layout the pages and which pages you want to generate. There is also an advanced tab at the top of the menu with a few more options. I wouldnt suggest changing much here as the resolution is set for mobile devices to keep the quality nice and crisp. There is however a really good feature that InDesign has included for a Cover Thumbnail, this is particularly useful if you are intending to embed the document in to your website or share the document on social media. 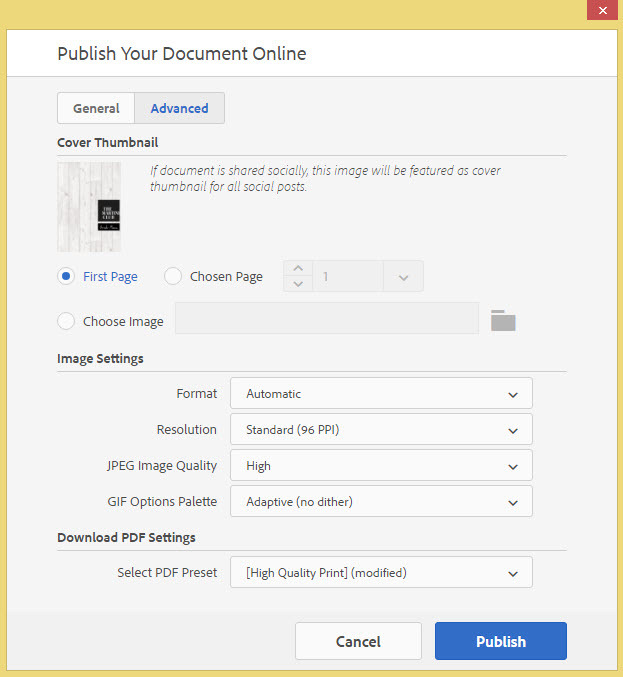 By default the cover thumbnail is the first page of your InDesign document but you can upload any image at this stage to replace it to make the post more eye catching. Depending on the size of your InDesign document this may take a minute or so to upload. When InDesign has competed the upload you will get this window, if you click on View Document InDesign will take you directly to the Online document, you can also copy the link if you want to paste it in an email or share on social media. There are also some buttons that you can click to bring you directly to your social media page or email application. 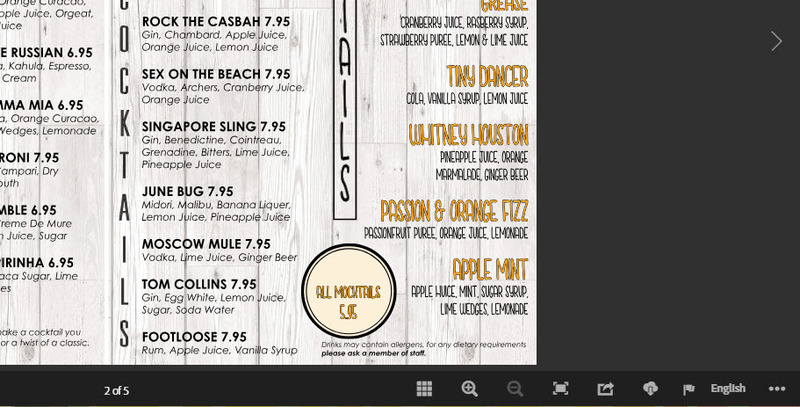 When you are viewing your uploaded InDesign document in a browser window you will notice in the bottom left hand side of the browser a series of buttons, these will enable you or any viewer to Download a PDF to your computer, get the embed code or share via social media. The beauty of Publishing your Indesign document on line is the fact that you no longer need to send attachments via email and if you are a more advanced user all the animation that you put in to the document will work too!